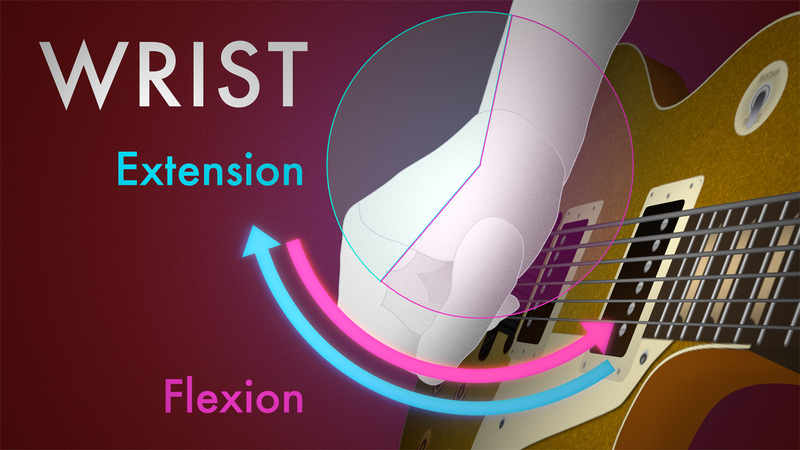 The wrist is one of the most important and commonly used joints in guitar playing. And yet, when it comes to popular guitar teaching, its function has been almost entirely overlooked. When it is addressed at all, it’s usually by way of clumsy analogies like “knocking on a door” or “shaking hands” that are so imprecise as to be mostly useless in teaching players how they’re supposed to move. But it gets worse, because those aren’t the only two motions your wrist can make. It turns out that in between handshaking a knocking, there is an entire range of motions, each containing slightly less handshake, and slightly more knock. And these two elemental axes of wrist motion are merely two points along a smoothly variable gradient from one motion to the other. In other words, the wrist can move 360 degrees, and different everyday activities — including guitar picking — make use of different angles based on a number of variables. Figuring out which of these myriad shades of grey you might need to use is determined entirely by your forearm position against the guitar. And to make matters even more complicated, if you’re interested in certain techniques, like crosspicking, you’ll need to choose not one but two of these motions and join them together to create a compound motion that is curved in two different planes of motion. If you’re a super genius, you might stand a chance of figuring this out on your own. The legendary Steve Morse actually described this dual-plane action of his crosspicking motion in our interview with him ten years ago. At the time, we were dimly aware that wrist motion and forearm motion were two different motions that guitarists used. And in Steve’s pantomime demonstration for the camera, it seemed like a combination of those two motions was what he was getting at. It was only ten years and much research later that we realized he wasn’t talking about combining two different joints at all. He was talking about using his wrist to make two different motions at once. And that, ladies and gentlemen, is why he’s Steve Morse and we’re not. In fact, this subject is so non-obvious to casual observation that researchers at New York’s Hospital for Special Surgery wanted to find out exactly how and when this sophisticated cooperation of wrist muscles, which they call coupling, actually works. 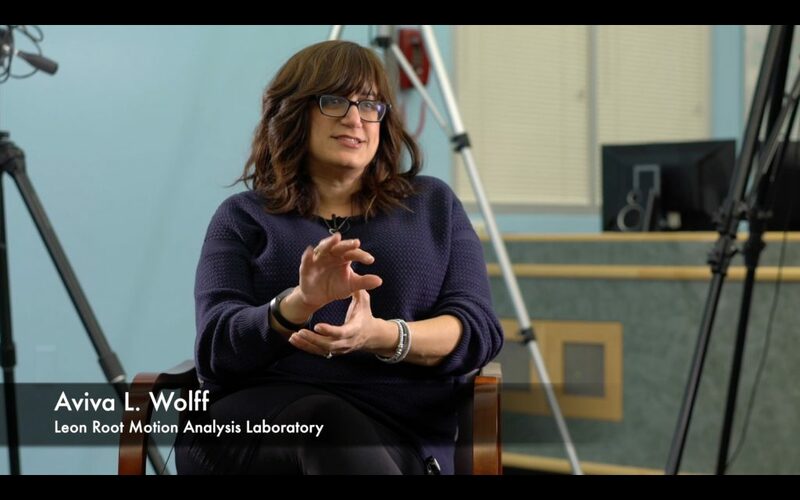 In our interview with researcher Aviva Wolff, she describes how they used motion capture equipment to measure subjects in a laboratory setting while they performed a variety of common wrist-based activities, from hammering to pouring. From the path the hand followed in each of these motions, they were able to deduce the relative blend of wrist motions at work. 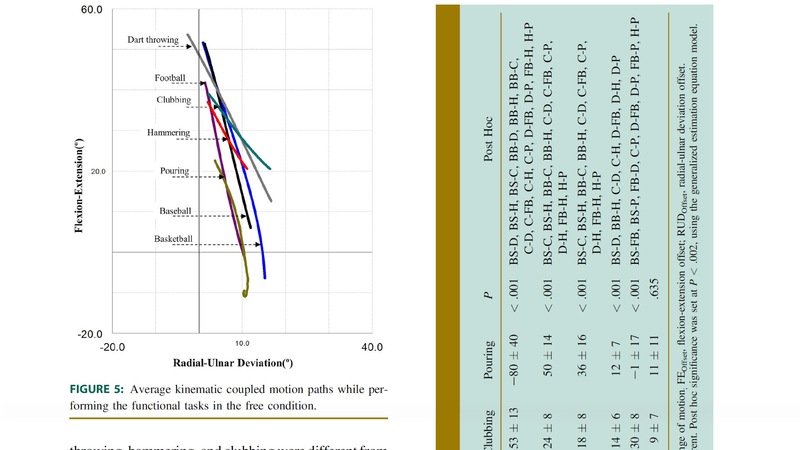 When graphed on two axes, one for deviation and another for flexion and extension, and averaged over multiple trials, the resulting plots produced a fascinating blueprint of human motion. If you’re starting to get the impression that the wrist isn’t always doing one thing or another, then you’re entirely correct. And yet from this range of many possibilities, choosing the correct wrist motion for whatever your arm position happens to be, is absolutely critical to picking technique, which has very specific requirements depending on the phrase you’re trying to play. 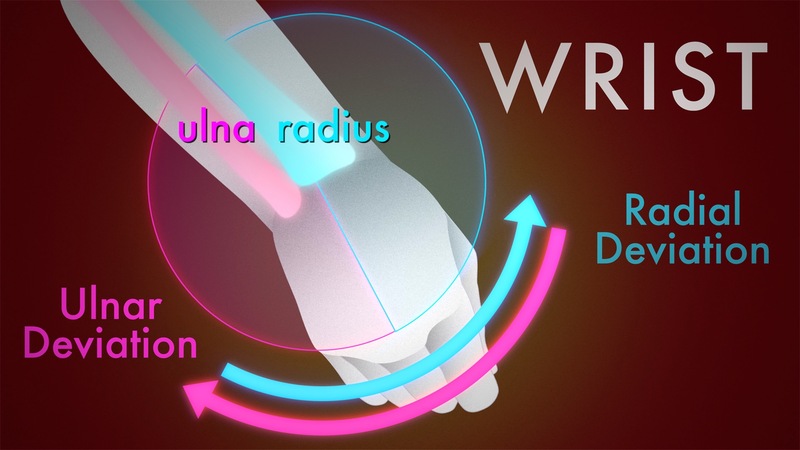 After three years, many interviews with players and researchers, thousands of miles of travel, and thousands of hours of tinkering, we’ve arrived at a simple and powerful way of describing what the wrist is doing. And — surprise! — it’s still an analogy. But it’s a better, more accurate one. And it involves an analog device that most us are hopefully still familiar with: the clock. By imagining the center of the clock as the center of a polar coordinate system, we can take this 360-degree range of wrist motions and lay them out in a circle, like the time labels on the face of the clock. In fact, to provide one extra point on the polar graph, let’s call the center of the clock “time zero”. This is the one point in our system where your wrist has no deviation, and no flexion or extension. 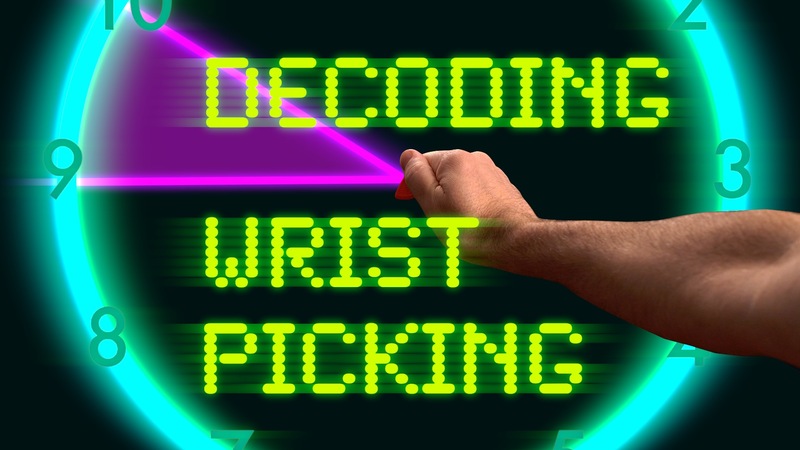 To use the wrist clock, point your arm at time zero, and line up your thumb with the 9 and your pinky with the 3. Your position is now locked and standardized. And from this standardized orientation, we can now describe wrist motions numerically. For example, wrist deviation is no longer handshaking: it’s nine o’clock to three o’clock. And flexion and extension are no longer door-knocking: they’re 12 o’clock to six o’clock. And all the shades of gray in between are now easily describable. Andy Wood’s pickslanting motion? 0-2. Andy Wood’s crosspicking motion? 9-0-2. Molly Tuttle’s crosspicking motion? 10-0-3. Steve Morse’s groundbreaking crosspicking technique that stumped everyone? 7-0-12. And the beauty of this, is that no matter which way your turn or point your arm, those numbers don’t change, because the clock turns with it. A deviation motion is always 9 to 3, and a flexion-extension motion is always 12 to 6, even if you windmill your shoulder joint like Pete Townshend while you do it. All you have to do to figure out which way your wrist is moving is remove it from the guitar, point it straight ahead of you at an imaginary clock face, and read the numbers it traces as you move. And like the scatter plots produced by the HSS researchers, you’ll now have a fascinating visual reference for the wide variety of motions you can produce, usually without even thinking about it, by one of the most critical joints in picking technique. 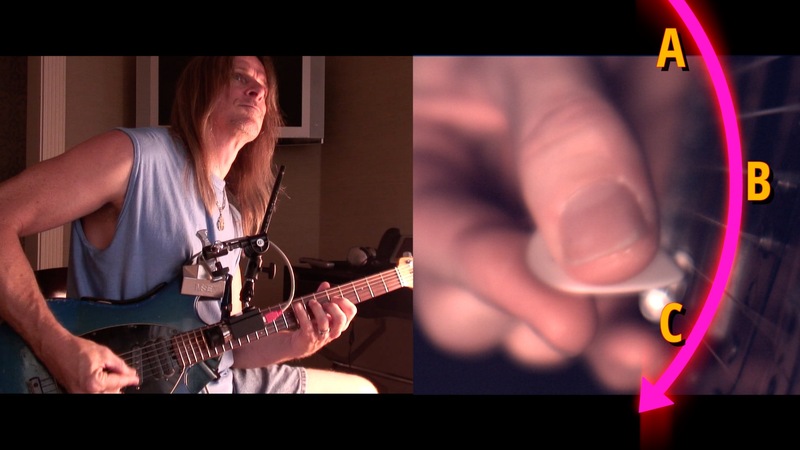 The wrist is the most commonly used joint in picking technique, and forms an integral part of so many basic picking motions, that the fact it has gone essentially unexplained for this long is practically criminal. Although the concept we’ve come up with is deceptively simple, it has already answered so many questions about how movements work, instantly unlocked at least one new ability, and clarified others I already had. Just knowing it has already made me a better player and improved just about everything we teach. My handshaking technique is definitely elbow-based. Should probably be called “arm shaking”. Not pointless, and totally relevant! We really don’t think too much about what movements we’re actually making, to the extent that what is elbow or forearm or wrist is totally subconscious for most people. Thankfully, otherwise everyday activities would require tons of thought. I used the “handshake” example because David Grier used it in our interview. But if most people actually elbow-shake, I can update the article to hammering or some other common motion with [approximatley] a deviational path. Hello I’m a new member, thank you for the great service you provide us guitarists. I am a lefty, and for me to effectively work the clock system while I study crosspicking, I believe it will need some modification. Since my orientation is from a different perspective, using a different hand, it seems the ‘clock face’ analogy will not correspond to the proper direction being invited by the instruction. Is there a simple system that would allow me to translate right-hand oriented clock face wrist motion to left-hand oriented clock facewrist motion? I believe I will need this to get the proper movements. Thank again. This starts as a reference to the reply to a “pointless aside” for clarity. I would like to suggest that these so called “everyday activities” are actually thought itself the- totality of thinking, (demonstrated in movement, like making music), hence not having to “think about them”. One more suggestion is that perhaps that flat land of a clock-face could be updated to a sphere(I feel this applies to any instrumental or skill oriented self description (phenomenologically speaking ). I appreciate your work and watched some youtubes especially the one with Batio - it seemed he felt that 12 - 6 and 6 - 12 was the most effortless safe movement I tend to agree at least on one string. Perhaps the search for the better analogy will always lead to more analogies(as Herman Hesse made clear). Next PostThe Four Fundamental Pickstrokes - Can You Spot Them?